A Qikiqtani Inuit Association outreach project aims to make it easier for North Baffin Inuit to learn more about the impacts and benefits of the huge Mary River iron mine near Pond Inlet. That’s because people in the nearby communities of Arctic Bay, Clyde River, Hall Beach, Igloolik and Pond Inlet will soon be able to see the important parts of the complex Inuit Impact and Benefit Agreement between QIA and the Baffinland Iron Mines Corp. in infographics that use Inuktitut and English. 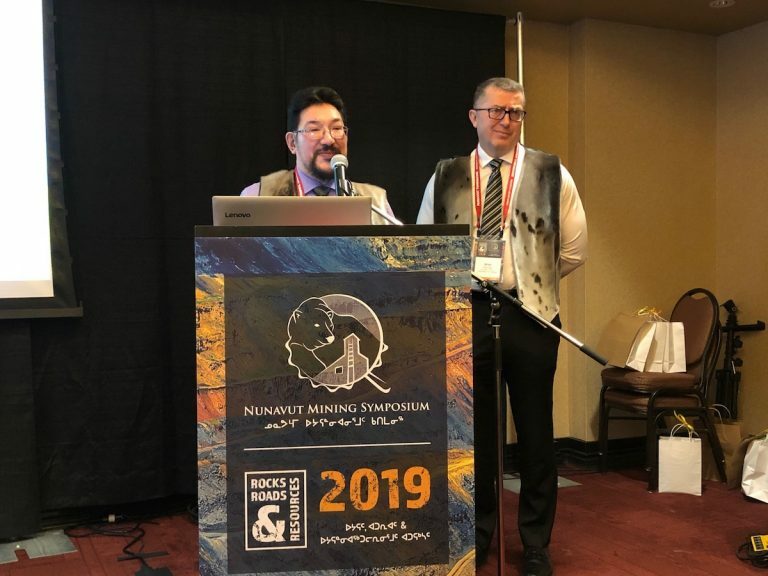 Instead of the actual legal document, which runs to roughly 115 pages in English and 200 in Inutktitut, there will be a compact book, as introduced by QIA board member Levi Barnabas on Wednesday, April 3, at the Nunavut Mining Symposium in Iqaluit. The book will feature yellow pages with Mary River project information, blue pages that explain IIBA articles and white pages on the various socio-economic, cultural and environmental impacts from the mine.